I rediscovered these delicious pies when a kindly neighbor, someone I barely knew, knocked on my door and presented me with a wooden tray of still-warm chicken pot pies. I had just returned from the hospital and answered the door balancing a wailing infant in each arm. Every time I tuck into a chicken pot pie, I remember my neighbor’s kindness and the simple comfort of an old-fashioned savoury pie. Those wailing babies? They’re now chatty, leggy teens, who order up chicken pot pies whenever they’re given the choice. Pies can be made in any size if container. During a home exchange in Bordeaux one summer, I found in a cupboard a beautiful blue terrine, pictured below. My globe-trotting friend, Caroline West, was there to capture the image and enjoy the pie. This is not a difficult recipe but it does take time to prepare. I prefer to prepare my pastry in advance, leaving only the filling to prepare. You can use ready-made pastry dough but nothing compares to homemade. For the flakiest crust, I use lard and have consistently good results from the recipe on the back of the Tenderflake box. The key to making flaky pastry is a light touch and not adding too much flour. This is easy when you roll the dough between a sheet of parchment and plastic wrap (plastic on top, so you can see what you’re doing). This prevents the dough from sticking to the table, which means you don’t need to add additional flour or handle the dough excessively. If you’ve ever been frustrated by making pastry, this simple tip will solve your pastry woes. The savoury filling is adapted from a chicken potpie recipe from Rombauer, Becker & Becker’s Joy of Cooking. Place the flour and salt in a large bowl and mix well. Cut the lard into 1 – 2” pieces and add it to the flour mixture. Using two knives or a pastry blender, cut the lard into the flour until the mixture resembles coarse breadcrumbs. The mixture should not be uniform; it’s best to have some larger pieces of flour-coated lard along with the finer particles. In a 1 cup measure, combine 1 egg with the vinegar and add enough cold water to equal 1 cup. Gradually stir in half of the liquid into the flour. Add only enough water to make the dough cling together. On a lightly floured sheet of parchment, shape the dough into a disk and gently roll it into a circle approximately 1/2” thick. Cover with plastic wrap and chill for at least 30 minutes before using. Continue to roll out the pastry dough, starting in the centre, to a thickness of approximately1/8”. 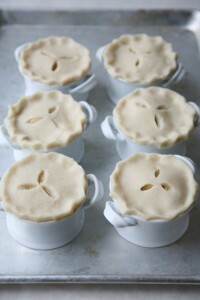 Cut the pastry into rounds that are about 1/2″ larger than your ramekins. Cut small holes or vents into each circle. Stack the pastry rounds, with a layer of parchment between each, in plastic freezer bags and store in the refrigerator or freezer until ready to use. Pastry, wrapped in plastic, can be stored in the freezer for 6 – 8 weeks. Melt the butter in a medium saucepan over medium-low heat. Whisk in the flour and cook for a few minutes, stirring constantly, until the flour and butter mixture is golden in colour (this is called a “roux”). Add the chicken stock, milk and cream to the roux and whisk until heated through and mixture starts to thicken; this will take several minutes. Continue whisking to ensure there are no lumps. The sauce should be thick enough to lightly coat the back of a spoon. Add the lemon juice, cheese, salt and crushed red pepper. If the mixture is too thick or heavy, add a bit more stock. To ensure each vegetable is properly cooked, it’s best to cook each variety separately. (Carrots, after all, take longer to cook than celery.) Heat one large spoonful of butter in a large saucepan and add the diced shallots with a pinch of salt. Cook the shallots until transparent, adding more butter if necessary. When the shallots are cooked, place them in a fine-mesh strainer over a bowl to drain any excess butter. Repeat the process with the celery and carrots, seasoning each variety lightly with salt and taking care not to overcook them. The frozen peas do not need to be cooked. Add the cooked vegetables, peas, diced chicken and freshly minced herbs to the sauce. Taste the mixture and season, if necessary, with additional salt, lemon juice and pepper. Remove the pre-cut pastry from the fridge or freezer (if frozen, thaw before using). Place your ramekins on a baking sheet and fill each one with the creamed chicken and vegetable mixture. Brush the rims of the ramekins with the beaten egg. Place the pastry rounds on top of the ramekin and press the edges down with your fingers, crimping the pastry as you do so. Cut vents into the pastry, if you have not already done so. Brush the top of the dough with the remaining egg. 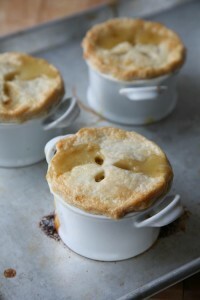 Bake the pies until the chicken mixture is bubbly and the pastry is browned, approximately 25 – 30 minutes. Note: If you freeze unbaked pies, allow them to thaw in the refrigerator before baking them. 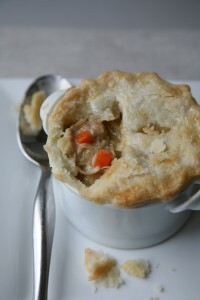 These chicken pot pies are the best! Thanks Willy. If you have a hankering for fish pot pies, you can use fish instead of chicken. absolutely the best chicken pot pie ever, make pastry ahead and cut circles for tops and freeze, then quick and easy to make filling – sooo good! That’s the best way to make them, Frankie — pastry ahead of time, so it’s not so time-consuming. My family loves them, too. I’ve yet to make a pastry that works. This I am certainly going to try. I’m going to make the pastry first and freeze it so I don’t have have too many steps at once. Thanks Denise!! your terrific! Sounds like a good step-by-step plan, Louise. Try rolling the pastry between a sheet of lightly floured parchment paper and plastic wrap (the plastic on top, so you can see what you’re doing). You’ll pastry woes will soon be behind you! 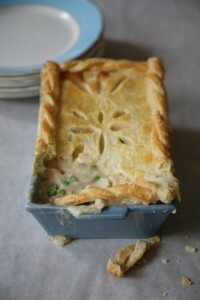 I saw that picture of the chicken pot pie and immediately smelled the richness of the pies! I still make them on a regular basis. Best wishes for 2013. The website is fabulous. Ohhhh, the pictures!!!! Ohhhh, the food! You make me laugh, Nancy. I so appreciate your enthusiasm! I’m pleased you’re still making those pies. My family never tires of them.